Martien Van Der Hoeven and Easy Touch 4 make it look easy. Flashpoint Photography. What a night! The Classic Company’s inaugural $10,000 Six Bar class was the talk of the horse show community Friday night at the Georgia International Horse Park which took place center stage in the Olympic Arena. “The six bar class was amazing. There must have been 1,000 at the grand prix. Literally everyone at the show was watching!” commented Classic Company President Bob Bell. “The class is a straight line of six fences. We started the first fence at 3’9. As each rider went clean, the fences were raised. We did four rounds and ended with the last fence at 5’10”. We ended up with a three way tie and the crowd just loved it!” said Bell. Derek Petersen and Cassevel fly over the Six Bar challenge. Flashpoint Photography. The three victors were Martien Van Der Hoeven of Spring, Texas in the irons of Courtney DeHechavarria’s Easy Touch 4, Michael Murphy of Apopka, Florida riding Suzanne Dennis’ Bunny Hop, and Derek Peterson of Archer, Florida in the irons of Madddie Skimming’s Cassevel. Paul McCrea of Alpharetta, Georgia rode Krista Jones’ Diamond DeLuxe and made it to the fourth round. But eight jump faults would keep them from the winner’s circle. Van Der Hoeven also rode Augusta Pines Farm’s Nuateloe. The team was out after Round 3 saw them with four jump faults. Round 3 also claimed Sherry Hill of Cordele, Georgia on her own Bellami and Randii Goble of Friendsville, Tennessee aboard Icon Sporthorses, LLC’s Queen of Calla, both with four jump faults at the last fence. Round two spared all of the horse and riders and round one claimed Mary Katherine Hargreaves and her own Jump Start with eight jump faults. During the event, the Annual Silent Auction also took place for those looking to make a win outside of the ring in the sold out tent. Outback Steakhouse served ribs, chicken breasts, Caesar salad and deserts. “The food was delicious and everyone had a great time,” said Bell. Thursday night the Open Jumpers saw 29 take to the course designed by internationally known course designer, Steve Stephens of Palmetto, Florida, but only 10 went clean. Stephens has designed courses for the Olympics and the Pan Am Games. He is one of the most well-known course designers in the world. Of the ten that went clean, Derek Petersen’s Titus 2:11, ridden by Jared Petersen of Archer, Florida, won the class with a double clean round and jump off time of 31.013 seconds, well within the time allowed of 47 seconds. Trapatoni, owned by Billie Dorouet and ridden by David Jennings of Franklin, Tennessee, came in second after turning in double clear rounds and a jump off time in 32.06 seconds. Third place finisher was David Blake of Parkland, Florida aboard Doma Sue, owned by Pine Hollow Farm, after turning in double clear rounds and a jump off time of 33.221 seconds. Did you book your beach condo? The Show-cation destination is coming up at the Charleston Summer Classic which starts July 8 through 19. Beach front condos a few minutes from the show grounds are where the riders stay, so don’t miss out on the best show-cation of your life! Bring the family, friends, dogs and horses! Minutes from the beach and only a short drive to historic Charleston, this is the show that offers something for everyone from fishing to kayaking, to shopping to wave jumping, from walk-trot to weekly grand prix and hunter derbies. This is your Show-cation destination! Anyone who has shown with the Classic Company knows what sets them apart from the rest: Classic Shows are FUN! Friday night exhibitor parties, Saturday night grand prix, complimentary ringside Saturday pizza and luncheons all with the exhibitor in mind! And remember, Classic Company does not charge extra office fees for credit card transactions nor is there a scratch or add fee! Classic Company wants to make your showing experience the best ever! The Classic Company is a USHJA’s Members Choice Award winner, recognized for producing top quality show jumping events in the United States. 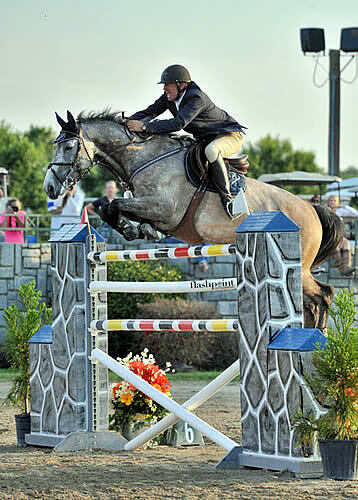 For more information on Classic Company and its exhibitor-friendly, top quality hunter jumper events, please visit them at www.ClassicCompany.com or call them at 843.768.5503.